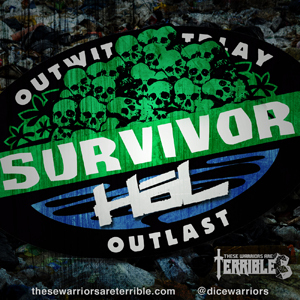 After the season finale of Survivor: HoL, Tom, Conal, Steve, Big Mike and our HoLmeister Derek discuss the game, our thoughts, what we wanted to do, what we didn't do. You know all the good stuff. In the Season finale of Survivor: HoL, during an immunity challenge nothing on Alpha team is what they seem being they are clones and all. So the remaining Beta Team members must find out what's going on and get out of the HoL, you know preferably alive. This time on Survivor, after a Reward Challenge win by Beta Team they are sent to a little amusement park where they try to "relax" and "have some fun" Nah, who are we kidding, blood and water is going to spill. This time on Survivor, Jimmy, Russell, Zorthog and Jack get assimilated into camp life the only way they know how. You know killing people and threatening them and stuff. The Tribe has spoken for one of our tribe members, who would that be? This is Survivor, the HoL!